TENSION - 5tr and 2 rows of tr's measure approx 1 Inch using 5.00mm hook. Pattern Row 1 - 3ch, 1trf into next, * 1tr into next tr, 1trf into next, * rpt from * to * to end, tr into top of 3ch. Turn. tr into top of 3ch. Turn. Rpt Pattern Rows 1 & 2 until 21 rows have been worked in all. Fasten off. Border - Join in contrast colour yarn, make 1ch, 2dc into base of 1ch, 1dc into each tr across to 3ch to turn, 3dc into top of 3ch, work 41dc evenly into row ends down first side of dishcloth to corner, 3dc into corner, working along cast on edge work 1dc into each ch to corner, 3dc into corner, work 41dc evenly into row ends up second side of dishcloth to corner, 1dc into base of 1ch, ss to first dc. Turn. Next Row - 1ch, 2dc into base of 1ch, 1dc into each dc around all four sides of dishcloth, working 3dc into corners and ss to first dc on beginning of row. Rpt last row once. Fasten off. Turn. 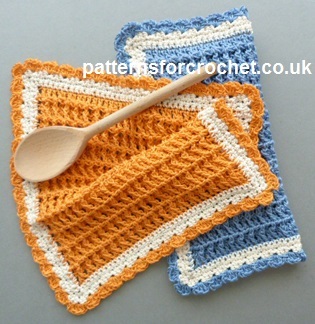 Decorative Edge - Join in main colour with a ss to first dc, (2ch, 3htr, 2ch, ss) into same dc, * miss 2dc, (ss, 2ch, 3htr, 2ch, ss) into next dc, * rpt from * to * around all four sides of dishcloth to last 2dc, miss 2dc, ss to first ss. Fasten off. Finishing - Weave in and trim off any loose ends of yarn.